Fiedos and Ronald Gearing up! Part of what TRACC does is encouraging the community to get involved with the ocean. Part of how TRACC does it is through subsidizing Discover Scuba Diving and Open Water Diving courses for community members and TRACC staff. This week, we were pleased to certify two members of the police stationed on Pom Pom Island - Mohamad Firdaus Bin Baharum (Fiedos) and Ronalius Bin Kineal (Ronald.) 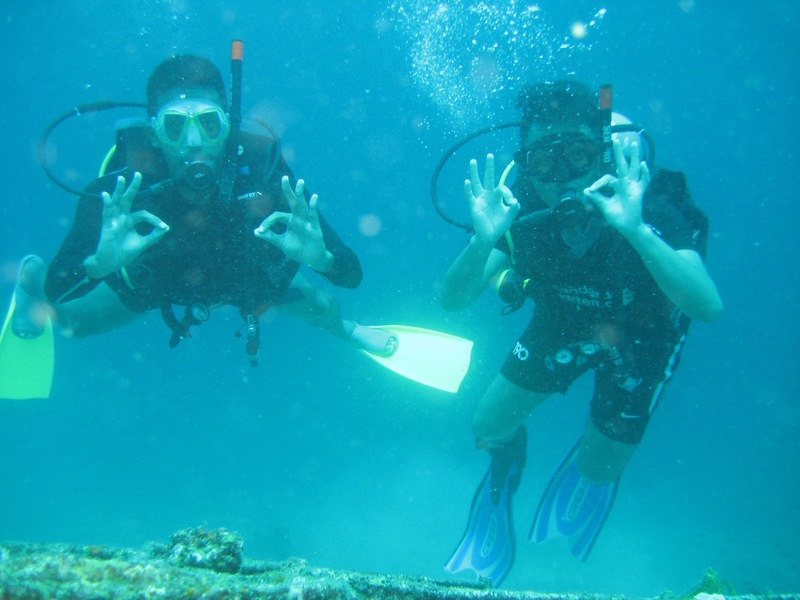 Fiedos and Ronald happily shared their experience getting certified and their thoughts on the ocean with us. Lark: How does it feel to be a newly certified diver? L: Have you enjoyed the Open Water Course? F & R: So enjoyed the course and the new experience! L: What is your favorite thing about diving? F & R: We like to see the underwater creatures: turtles, Nemo’s, big fish, also the wreck. F: It also makes me release my stress and I like the new experience. Now, I have a new skill, and I am so confident and comfortable in the water. Fiedos and Ronald Enjoying the Dive! L: Did you enjoying seeing the artificial reef TRACC has built on the open water dives? F & R: Yes! There are more fish (on the artificial reef). When we dove we saw, one frogfish, and the leaf scorpion fish around the artificial reef. So nice! L: How has your view of the ocean changed since becoming more involved with the ocean and diving? F & R: We see many fishing hooks and broken coral and the population of fish is sometimes low. Before this (diving) we liked the fishing, but when we joined TRACC we saw the sensitivity about the coral and the fish and it made us wake up! We do not want to go fishing here! L: Do you planning on continuing to dive in the future? F & R: Yes! Hopefully we can take the Advanced Course and Rescue, and continue to dive. 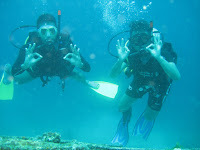 We want to go from 5 to 50 dives! 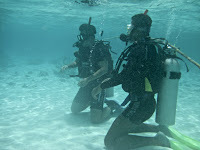 F: I hope I can be a Divemaster one day and if I have time I want to be a volunteer at TRACC. I have asked to be stationed on Pom Pom again in September, and if I am I will take the Advanced and Rescue with TRACC.